Blessed with beautiful weather we recently explored scenic vista’s in Anacortes and sailed through the San Juan Island archipelago to spend a couple of days exploring Orcas Island. It was the perfect getaway! We enjoyed hiking in Moran State Park and captured beautiful views from Mount Constitution. One of my favorite spots for photography is at Deer Harbor. Contact me today to learn how to be a better photopgrapher at Tel: 240-899-5295, info@jollysiendaphotography.com. Speed boat cruises through the San Juan Island archipelago with Mount Baker in the background. Contrails in the blue sky and sailboats at Deer Harbor. Evergreen tree reflection at Cascade Lake in Moran State Park. Aerial views of the San Juan Island archipelago and the Cascade Mountains from Mount Constitution summit. Person walks the beach in the fog at Ship Harbor in Anacortes, Washington. Sunset at Cap Sante, Fidalgo Island, Anacortes. Washington State Ferry sailings in the San Juan Islands with Mount Baker in the background. Yep — this is a little slice of paradise! Jolly Sienda Photography captures and tells a story of our world. Cruising around the fog around the San Juan Islands, Washington. Love to hear from you! Contact me for information about individual and group photography classes at 240-899-5295, info@jollysiendaphotography.com. Cool, pastel, winter skies…wind, clouds, and sun-breaks…golden cattails and marshland…and snow on the barren farmlands, are the perfect beacon for birds of prey! The farms in the Skagit Valley are dormant and waiting for spring; yet its a feast for birders and birds alike that survive off of the grubs, field mice, and fish in the fields and sloughs. Below are photos taken from our February 16-17 trip to Mount Vernon Skagit Valley and Whidbey Island. Winter Cattails whistle and sway gently from winters wind. Skagit Valley farm and farmland with a blanket of snow over the reeds and vegetation. Have you ever dreamed of seeing the ‘End of the World’? Or, checking off those ‘1001 Things to See and Do Before You Die’? Our recent trip to South America and Patagonia provided us some of the world’s most dramatic scenery; unveiling places few ever see. The weather too, in this area, can change so quickly; from calm to ferocious gale force winds preventing ships from traveling around the Cape Horn or arriving safely in Port Stanley, Falkland Islands. Boy, did we luck out! In fact, the captain of our cruise ship said, “This is the calmest it has ever been, on my watch, sailing around the Cape Horn” The following images were taken on our journey. Happy Holidays! Usushia, Agentina - last city on the South American continent. A cruise ship sails around the the Cape Horn, South America. Baby King Penguin wants to eat! The sunrise, cool crisp air, crystal clear water, warm autumn color, fog layers, Olympic Mountains, seagulls, a fisherman taking his boat out to sea, tranquil and calm — this is what I feel and see as I look, linger, and take in the natural beauty of the Hood Canal, at Seabeck. 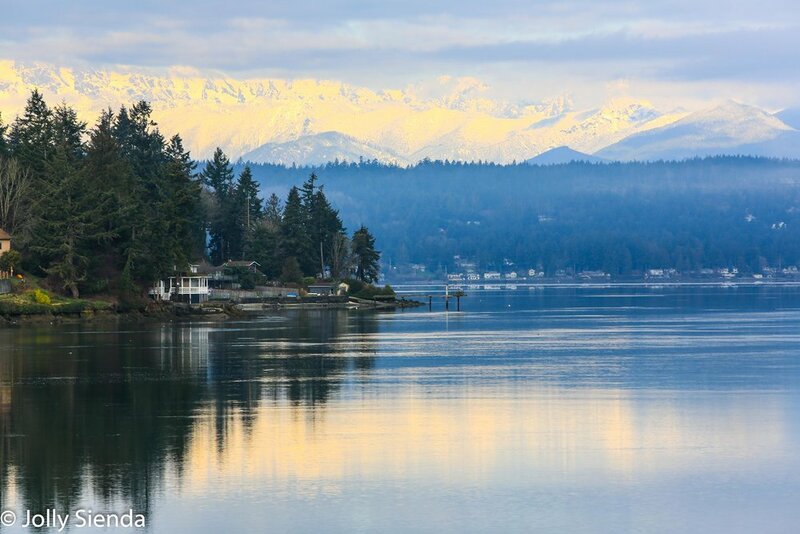 A picture perfect slice of Pacific Northwest paradise. Want to learn how to be a better photographer? Please contact me today to set up an appointment for one-on-one photography instruction. Tel: 240-899-5295 E-mail: info@jollysiendaphotography.com . Let’s have some fun and take our photography to a new level! Fisherman goes out on the Hood Canal in Autumn. Serenity, color, light, shadows, reflections…and more. 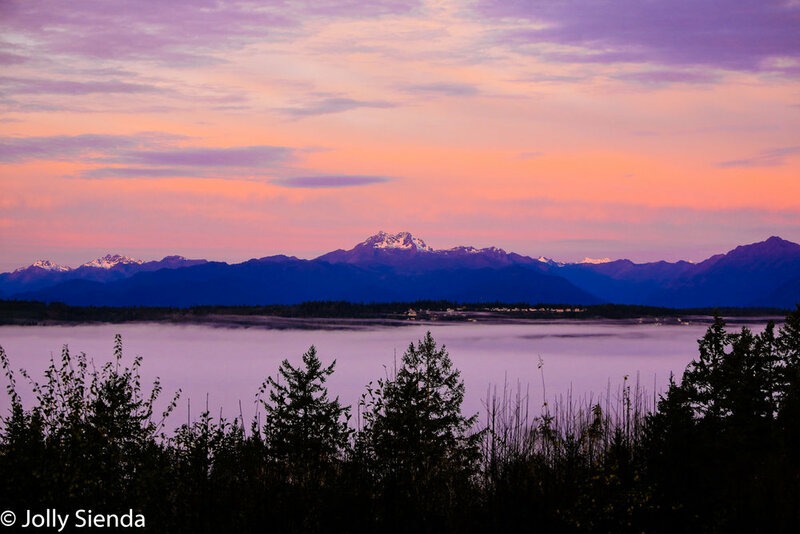 The Brothers Mountain, Olympic Mountains, peaks over light pillows of fog on the Hood Canal. 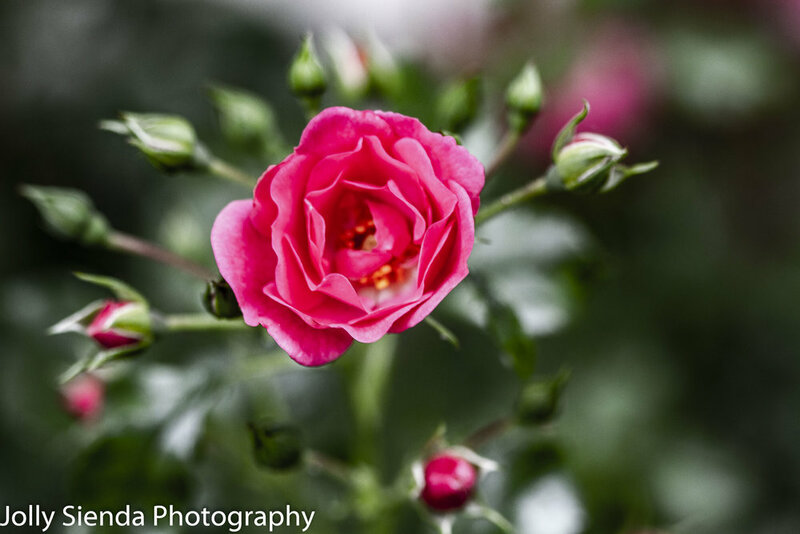 Whether you're a professional photographer or learning about photography a great way to learn and practice your skills is to go out into your yard and photograph the flowers in your garden. I love to experiment with wide angle and macro lens for this. This is a great way to understand color, texture, depth of field, design, and to train your photography eyes. Don't get discouraged. Let the natural world pull you in and keep practicing with you camera. Over time, I know you will be thrilled with your results! 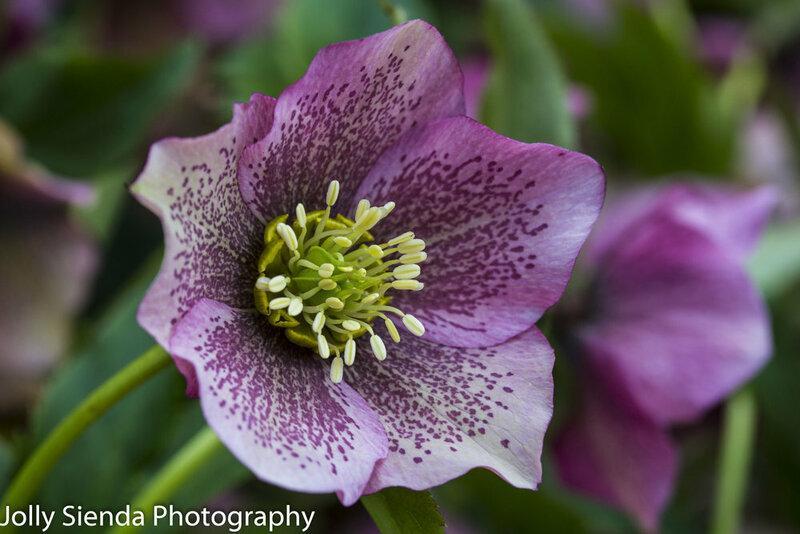 When you are -- make up some prints of your flowers and display them on your wall as a fine art photography gallery! So pretty!! See something you love! Please let me know! I'd love to hear from you. Fine art photography by Jolly Sienda Photography is available on this website or by contacting me. Winter weather can surprise and delight me all at the same time...when it offers soft, tranquil, pastel-like colors. The serene colors of nature's natural beauty puts me in a dreamy state of mind.